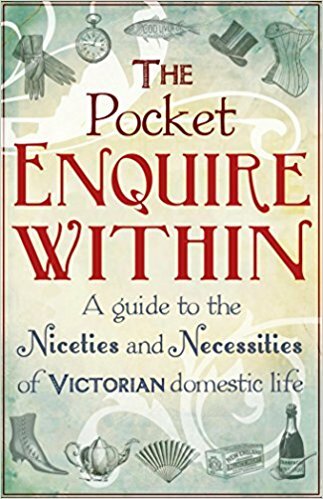 The Pocket Enquire Within: A Guide to the Niceties and Necessities of Victorian Domestic Life, ed. Once upon a time, in 1856, a general book of knowledge, mostly domestic, was published under the delightful title Enquire Within Upon Everything. It continued in print for over a hundred years and over a hundred editions! My mom gave me this "pocket" version, containing the most interesting and entertaining parts of the original 1856 edition, for Christmas. It's a fun book to dip into! Chapters deal with such topics as housekeeping, home remedies, family life, and entertaining. And wow, I learned a lot! The Enquire Within people were very big on leeches, for example. My first clue was a piece on "how often to change the water in which leeches are kept," which as you'll note, implies that keeping leeches is not unusual. The medical section then has lots of information on leeches, including how to use them (be careful when applying them to the gums, as they are apt to creep down the throat), care for them, and even use a leech to make a barometer. There were other topics besides leeches, though. The editors consider flour to be a better burn remedy than butter, and explain exactly why (actually, it doesn't sound too unreasonable for 1856). There are quite a few recipes, some of which sound pretty good, though I don't know how to tell if I have a "clear oven" or a "slack oven." And there's a whole section on spelling, grammar, and diction for those wishing to study it. They advise everyone to learn to swim, and give a good method for getting started -- walk out until you're up to your chest, then turn around and throw an egg into an area where you'll have to dive for it. I'm pretty impressed; 50 years later, even the Fabian E. Nesbit obviously considered swimming to be mainly for boys. There is also good advice for floating instead of drowning, though our usual dead-man's float doesn't seem to have been invented yet. I must say, the ingredients often sound enchanting. Remedies call for flowers of sulphur, wine of colchicum, and all sorts of lovely things. Whatever Muscovy glass is, I would like some. 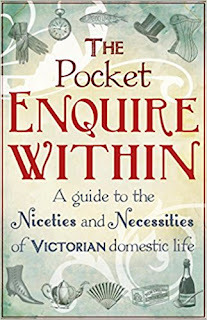 It's a practical book, aimed at the middle classes but with an eye to working-class people as well (though if you need to write a letter to the Queen, you can). It's just a perfect example of the Victorian spirit of morality and practicality mixed with as much sentimental poetry as possible. Personally I don't mind the moralizing; I can always use a reminder to yield not the golden bracelet of Principle while I live. Jean, OMG, I own this! 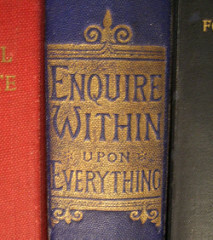 Not this, I own the actual Enquire Within Upon Everything -- my mum picked it up for me at a used-book sale ages ago. It's the dearest thing. I have recently been poking through the archives of the Athenian Mercury, which is a kind of Q&A format enquire-upon-everything advice column newspaper from the 1690s, and it's reminding me of how much I love old-time advice. Oh, how fun! I'd love to have one too.